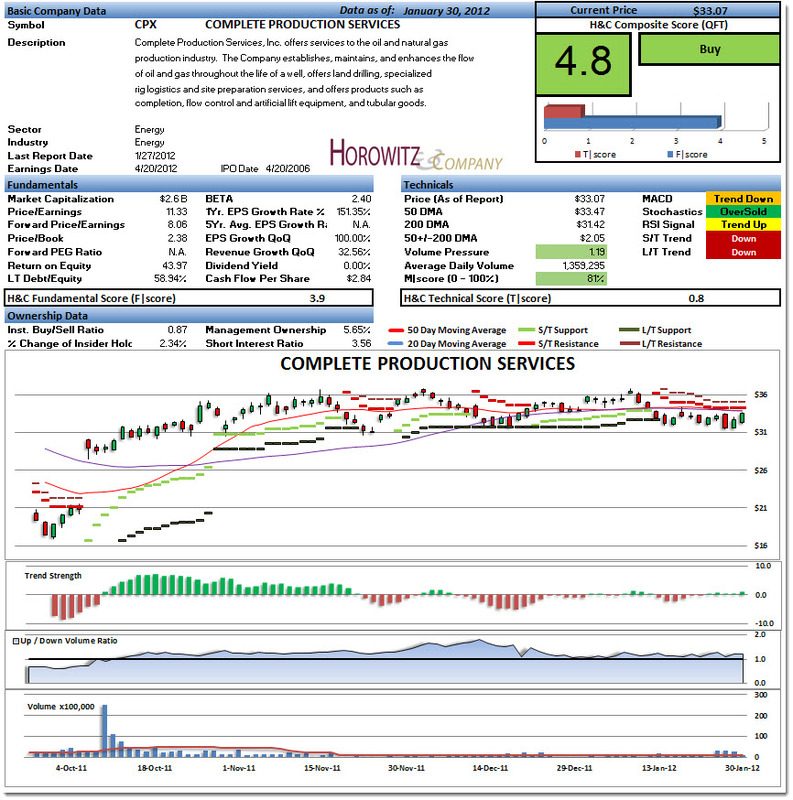 Horowitz & Company’s QFT Analysis on Complete Production Services (CPX). When the analysis and information is made available, we will update this table with the article link(s). Also, notifications will go out via Twitter Follow @andrewhorowitz – TweetWeek is coming , Feb 1st! H&C currently sees Complete Production Services (CPX) in a Short Term Downtrend and Long Term Downtrend. We find that EPS Growth on a Quarter over Quarter basis is one of the strongest components when screening for growth stocks. 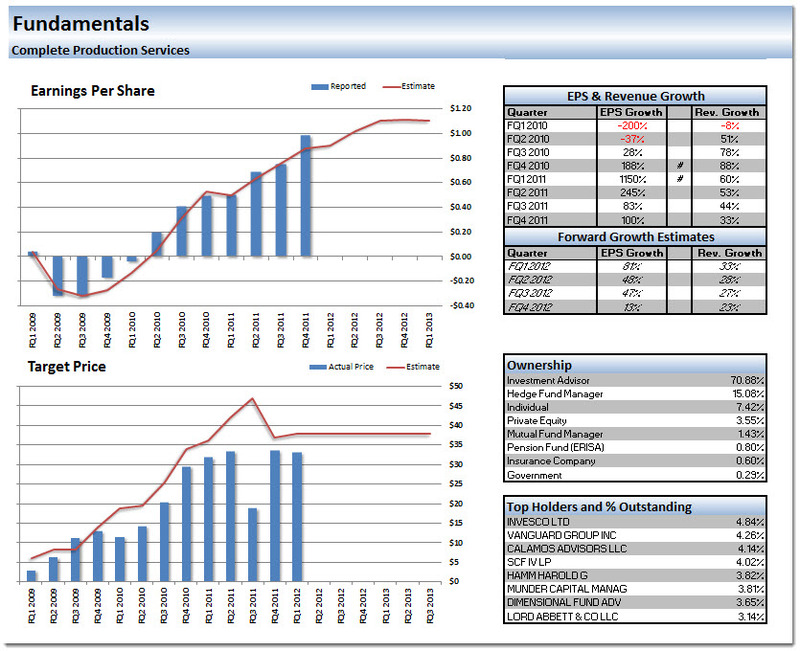 Continued EPS Growth in a company generally shows strength in leadership, the ability to manage expenses and improve the bottom line.Over the last three quarters, this company has done exceptionally well producing EPS Growth Rates last quarter, 2 quarters ago and 3 quarters ago 100.00%, 82.93%, 245.00% respectively. Revenue Growth similar to EPS Growth is also a strong component to consider when screening and scoring for growth companies. Continued growth in revenue shows that the company is innovative, marketable and its products remain relevant in the marketplace.Over the last three quarters, this company has done exceptionally well producing Revenue Growth Rates last quarter, 2 quarters ago and 3 quarters ago 32.56%, 43.88%, 53.22% respectively. Last quarter this company reported Earnings Per Share 11.87% better than analysts had expected. We believe this surprise although only for one quarter could set a trend for future earnings reports and guidance. Price relative to earnings growth is commonly referred to as the PEG Ratio. This company may contain added value as it’s PEG Ratio is 1.00. We generally would like to see the PEG ratio under 1.5 and it is even better if it is under 1.0.